I am a respiratory pharmacologist at the National Institute for Occupational Safety and Health in Morgantown, WV, which is part of the Centers for Disease Control and Prevention. My research focuses on the relationship between obesity and the severity of occupational asthma. I am also an Adjunct Associate Professor at the West Virginia University School of Medicine and School of Pharmacy. Furthermore, I mentor the research activities of graduate students, medical students, and clinical sub-specialty fellows and provide lectures in physiology and pharmacology to graduate and medical students. Finally, as a graduate student, I joined the ATS in 2000, and since that time, I have been committed to the Society’s overall mission as well as its desire to provide important career development resources for trainees. It is completely appropriate to respectfully say “no” to a Division Director’s request if it steals an inordinate amount of time from your research. Although saying “no” may sound selfish and appear as though you aren’t a team player, today’s funding climate and employment security requires PhD scientists to be extraordinarily focused on securing extramural grant support and publishing manuscripts. You don’t want to drown yourself in extracurriculars that fail to move your research career in a positive direction. I have been fortunate enough to have Division Directors who recognized the validity of a respectful “no” in response to potential assignments that wouldn’t have a positive impact on my research career as junior faculty. I have always been fascinated with the structural aspects of language, and after science, English and Spanish were my favorite subjects. In fact, I sometimes felt as though I was the only one who enjoyed diagramming sentences and conjugating verbs. With that said, I would probably be an English or Spanish teacher. Fortuitously, writing is an enormous aspect of effectively communicating research so I now feel as though I never had to choose between my two favorite subjects. As a “Yunzer”, or alternatively “Yinzer”, which is a native resident of the greater Pittsburgh metropolitan area, I was pleased when my current position brought me back to the area. On many weekends, especially during the summer, I find myself in Pittsburgh and absorbing many of the terrific things that the city has to offer, including sporting events, museums, restaurants, and theater. In addition, I enjoy reading historical non-fiction and spending time at Cheat Lake near my home in Morgantown, WV. I would be euphoric to see immunotherapy be overwhelmingly successful in the treatment of colorectal cancer, which sadly claimed the lives of my mother and maternal grandfather. In addition, I would be delighted to see improved communication concerning the importance of early detection of colorectal cancer and other preventable diseases to medically underserved populations. Because obese asthmatics are often less responsive to standard asthma medications, I would be excited to witness the development of pharmacological therapies specifically tailored to obese asthmatics. Recent data from pre-clinical animal studies demonstrate that IL-17A and IL-33 are potentially specific therapeutic targets to reduce asthma symptoms and severity in obesity. I find this to be terrific news since anti-IL-17A and anti-IL-33 monoclonal antibodies either have been already approved or are currently being assessed in clinical trials to treat inflammatory diseases. Thus, it wouldn’t be too much of a stretch for clinical investigators to determine whether these biologics could also be used to specifically treat obese asthmatics. Although I am an immense tennis fan, I haven’t yet had the opportunity to attend the four majors (Australian Open, French Open, Wimbledon, and U.S. Open). However, it is certainly on my “to do” list. 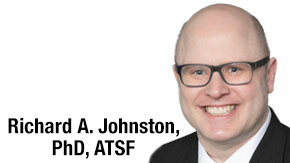 Disclaimer: Richard A. Johnston is serving in his personal capacity in response to these questions.